Powder coating takes the form of an electrically charged dry powder that bonds with a grounded metal part. The powder is a thermoset plastic or polymer, cured in an oven to form a “skin” that bonds to the metal surface. This skin is harder and tougher than a traditional painted finish. Powder coating can be used for most products that don’t need to be treated for excessive heat or durability; parts of that nature would be better served by our high-temp ceramic coating. A common powder coat comes in an almost infinite combination of colors and styles. It can take the form of a matte, satin, or glossy color and everything in between. It can be finished in any style from a single solid color to a candy, glimmer, or hammered finish. 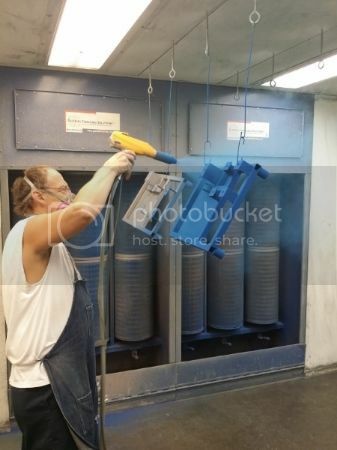 Phil is shooting a gloss blue on the parts below. It is thicker (and thus more durable) than traditional painted finishes. It can be 2-6 times thicker for a single coat powder, and 6-10 times thicker (6-10 mils, or .006-.01″) for more durable, multi-part coatings. The very nature of a powder coat has greater adhesion than other coatings. The powder adheres to the metal and impregnates itself into the pores opened up by media blasting during the prep stage, giving it much better overall adhesion. In addition to staying on the part better, it is a considerably more durable finish. It is a physically harder material than normal paint or chrome (partially due to the chemical compound, and partially due to the overall thickness), which gives you a greater scratch and chip resistance on your part. It is naturally resistant to rust and corrosion. Because the powder actually bonds to the pores of the metal (rather than simply covering the outside) it resists rust’s tendency to spread throughout a metal part from a single scratch or ding. Apart from being more durable and resistant to scratches in the first place, it won’t spread from the initial location if you do manage to scratch the finish of a powder coated part. What are some Common Parts? Auto and Motorcycle parts not susceptible to excessive heat. Indoor and Outdoor furniture, trim, yard ornaments, and much more. Restoration Pieces such as gas pumps, antique wrought-iron parts, milk jugs, etc. Below is a Porsche 911 (SCCA Car) frame that we coated. We coated the body panels and wheels of this car as well. For more information and to find out what type of coating is right for your part, please don’t hesitate to contact us at 913.321.2116.